New extended cut of the latest X-Men installment. "The differences in the Rogue Cut include extended scenes, plus extra dialogue for some characters. The new scenes add some cohesion to the movie allowing it to feel more linked to the past and present of the X-Men franchise." Can we change the past to create a better future? With the release of X-Men: Days of Future Past Rogue Cut on Blu-ray, DVD and Digital HD, viewers are invited to travel back in time to see an alternate version of the original X-Men movie first released in May 2014. But, is it an improvement on what we have at present? 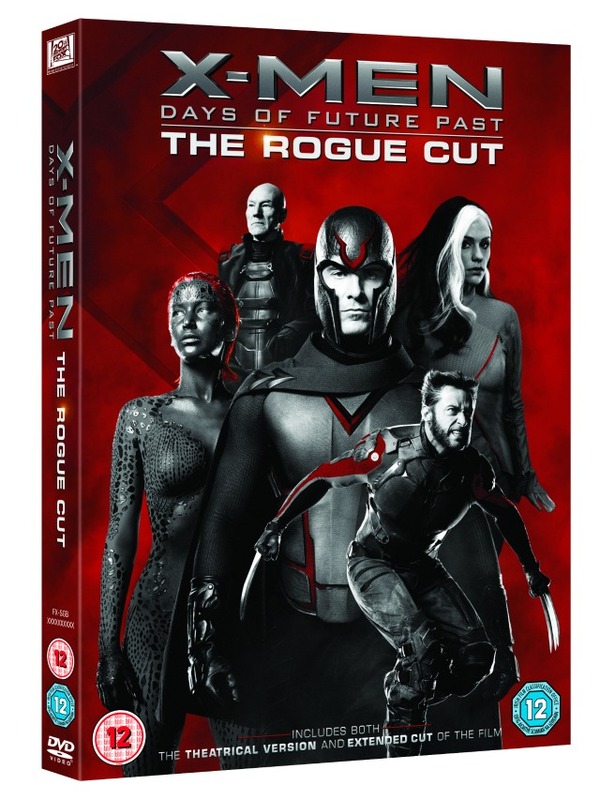 Fox Home Entertainment's executive vice president of marketing-communications James Finn, promised that the Rogue Cut Blu-ray would be a "distinct film" with "distinct extras," which indicated that it would not just be a rerun of the original Days of Future Past Blu-ray, saying on Twitter that "[It'll be] complimentary to DOFP Blu-ray but not repetitive". I’m not convinced that anyone except the die-hard X-Men fanatics would see it his way though, mainly because there is virtually no alteration to the narrative – the future Professor X (Patrick Stewart) and Magneto (Ian McKellen), using the mutant power of Kitty Pryde (Ellen Page) send Wolverine (Hugh Jackman) back in time to recruit their latter day selves (James McAvoy and Michael Fassbender) in a bid to stop Mystique/Raven (Jennifer Lawrence) from killing anti-mutant scientist (Peter Dinklage) and initiating the creation of the ‘Sentinel’ technology that utilizes her mutating DNA to adapt to any mutant attack and enable the ‘Sentinel’ robots to wipe them out. The additional 17 minutes of the Rogue storyline involve a sequence with Professor X relaying instructions to Magneto and Bobby as they search for Rogue, who's been imprisoned in the bowels of the Mutant school, as scientists try to exploit her mutant power of absorption. For fans of the franchise, it may be fun to see Anna Paquin back as the tragic, white-streaked mutant. Her inclusion does endow the movie with a greater feeling of ‘completeness’ even though she actually plays a very small role. The differences in the Rogue Cut include extended scenes, plus extra dialogue for some characters. During the opening scene, when the Sentinels ambush mutants at a Chinese monastery, there are longer fight sequences and some extra dialogue for Bishop (Omar Sy) and Blink (Fan Bingbing). Wolverine has an extra scene with his 1970s waterbed-girlfriend providing some light relief after the film's frenetic opening. At one point, we have an oblique reference to Peter ‘Quicksilver’'s twin sister when we meet him for the first time. Mystique and Hank (Nicholas Hoult) enjoy a steamy scene after she breaks into the X- Man mansion one night looking for sanctuary. Perhaps most satisfyingly, there is an exchange between Wolverine and the young Charles Xavier when he encourages him to have faith and assemble and unite the scattered mutants (hopefully in an attempt to link Days of Future Past to the 80s setting of the upcoming Age of Apocalypse). Some extras are indeed superfluous, and it’s easy to see why they ended up on the cutting room floor to economize on the running time. On the other hand the new scenes add some cohesion to the movie allowing it to feel more linked to the past and present of the X-Men franchise. The Rogue Cut of X-Men: Days of Future Past, is out 15th July on Blu-ray and DVD. (Bonus should include commentaries for both versions, 90-minute 9-part documentary and a sneak preview of the upcoming F4).